The smell of freshly popped popcorn wafts up from the stove after the tap-tap of kernels on metal. It’s a random thing to bring on a trip, but a nice treat around the fire. If you’ve ever been on an extended trip, you know just how old cheesy pasta or cous-cous gets after weeks and weeks. Beware of burnt kernels. Here are some tips for getting you through the crux. No burnt corn! Just perfect white fluffy popcorn smothered in butter, and in this case, a little salt and curry powder. 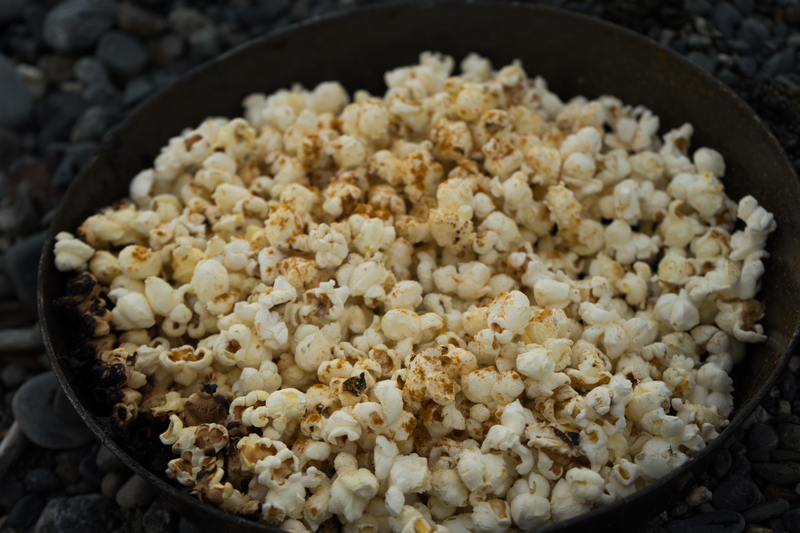 Crunchy and fluffy, backcountry popcorn can be a real treat after extended weeks of mush on an expedition. 1. Oil or butter. I prefer butter. Lay down a thick layer in your pan. If you are at the end of an expedition (this is usually the case) and all you have left is popcorn, a tiny bit of oil or butter and not a lot of patience, use a bit of water. The steam will help them pop. 2. Put in your kernels. In an even spread, do a single layer of popcorn kernels. 3. Put a lid on it. If you have a pan with no lid, use a pot lid. I prefer the fry-bake, and you can either use its own lid or a pot. 4. Shake it. If you leave it put, the heat will likely stay in the middle and burn some and pop a few. Shaking the kernels will help to get good poppage. Either a pair of plyers or pot grips will do. 5. Patience. This is the tricky party. Once you start getting active “pops” you need to keep shaking and don’t open the lid. You will lose your potential to pop all the kernels. Hang in there! 6. Add extras. I like “hippie popcorn” which is just a little bit of curry powder and salt on top of butter. Enjoy!